Hi, my name is Gabriel Low. My name is Gabriel Low and I am a 17-year-old triathlete, singer and aspiring scientist with a rare disease called Primary Periodic Paralysis, or PPP. PPP causes attacks that affect your muscles, resulting in extreme weakness or temporary paralysis—most often the inability to move the muscles of the arms and legs. The most common forms are hyperkalemic and hypokalemic periodic paralysis. PPP affects approximately 4,000 to 5,000 diagnosed individuals in the U.S.
Eleven years since being diagnosed, I continue to learn how to manage my condition. My mother, Emily is my biggest inspiration. Her efforts to help me grow up with PPP and not have to face the same challenges she did is the reason why I ride. I am dedicating the Ride for Rare Diseases to her. She always pushed me to do things that she knew I could. 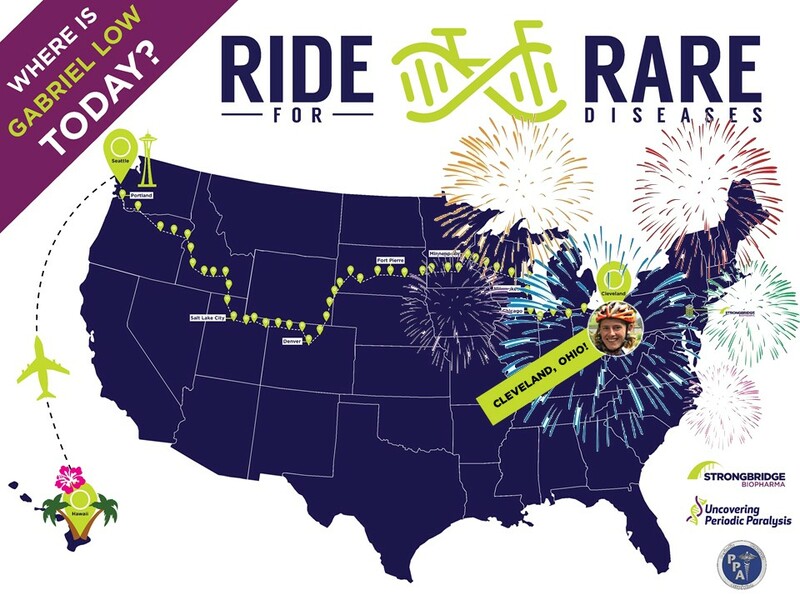 That’s why this summer, I am cycling 3,000 miles across the country from Seattle, WA to Cleveland, OH, sharing my message with as many people as I can along the way to raise awareness, promote support, and advocate understanding for rare diseases. Please join me virtually on my ride! My 3,000-mile route started in Seattle, WA on June 11, 2018, and will end in Cleveland, OH in early/mid-August, just in time for me to compete in the USA Triathlon Age-Group National Championships. Shortly after I compete, I will be traveling to Dublin, Ireland, to speak at the 2018 Periodic Paralysis Association International Conference, where I will share the story of my Ride for Rare Diseases. Strongbridge Biopharma® is supporting my ride based on our shared goals of raising awareness and promoting advocacy and early detection for rare diseases like mine, which are often mistreated and misdiagnosed. Am I coming through your area? If so, come out and join me for a short section of the ride! Even if you are not a biker, still come say ‘Hi’ while I ride on by – I’ll be keeping everyone posted of route plans on social media – so be sure to follow, like, comment, and share! My mission on this journey is to advocate an overall awareness for rare diseases, in an effort to decrease the trend of misdiagnoses and undiagnoses of rare diseases, which can be very hard, even devastating, for many of us with these diseases. I also hope to raise funding and support for research into how exercise can benefit people with my disease, HKPP. Get involved by following me on social media and donating to my Ride for Rare Diseases GoFundMe account. I give updates daily on my ride through Facebook, Instagram, Twitter and Youtube, so make sure to follow me and keep in the loop! The money donated to my GoFundMe page will cover any expenses for my ride that are not paid for by my sponsor, Strongbridge Biopharma. Any other donations that are not used for my ride expenses will be donated to the Periodic Paralysis Association, for rare disease research. You can also donate to the Periodic Paralysis Association Directly by clicking on the button below. Thank you to the presenting sponsor of this ride, STRONGBRIDGE BIOPHARMA®, and to all the other sponsors that have also contributed to the ride including Bioastin, Rudy Project, Gum Design, and Hilo Bike Hub.